I used to be wary of using too much technology in our homeschool, equating it with blank stares at screens. Over the past few years, however, my relationship with technology has evolved! I no longer see technology as a passive, stare-at-the-screen-pursuit. In our homeschool, technology is a let’s-dig-deep, engaging enterprise, encouraging us to connect with each other and the world around us. Here I share 5 ways our family uses technology to spice up our homeschool! My 14 year old has been using Skype as a learning tool for about three years now. You see, he wanted to learn computer programming. His uncle is a programmer. The only problem is that we live almost 2 hours from each other. Definitely not close enough for a regular programming meet-up! And when he started at age 11, most of the classes around us were geared for high-schoolers. Thankfully, Skype was an easy way for the two of them to “meet” each week. They share screens when they’re working through some challenging code, chat “hands-free,” and even text with questions throughout the week. Together, they’ve built two robots, a drone and a robotic arm. And this year, they plan to build a 3D printer from scratch! I’m so thankful that we have access to technology that allows my son to explore topics that interest him! Do you have a child who would love to learn about something that is outside your expertise? Explore ways you can connect her with other knowledgeable people to mentor her in her passion. The ideas and interests that can be shared via Skype are truly endless. Kids love to take videos! My phone is full of the impromptu skits and songs and snapshots that my kiddos have recorded to share later! Whether they know it or not, these videos are a starting point for writing. As they tell a story to the camera or act a scene, they are writing. Not in the pencil and paper kind of way, but the skills are the same. They are finding creative ways to portray their imaginations and developing a love of language! I love sneaking in writing when they least expect it! Two of our favorite technology resources that encourage my kids to take their filmmaking, storytelling and writing a little deeper are the Filmmaking Course for Kids by Raising daVinci and Stopmotion Explosion! Both of these invite my kids into the process creating their own stories and films in a very gently way. They weave together writing, art, creativity, technology and teamwork. I know that when they ask to work on their filmmaking projects or “play” with Stopmotion Explosion that I’d better clear the rest of the day! They jump in and the creativity starts flowing. It’s so rewarding to watch their faces light up as they think of a new idea or find a solution to a challenge. If writing has become a frustration in your homeschool day, bring the joy back with filmmaking. The authenticity of the project has a way of drawing kids in, like an invitation to a party! Documentary Day has earned its place among our homeschool highlights! I’ve written about how we use Documentary Day over at my blog Nurtured Roots. I encourage you to head over and find some inspiration for starting your own Documentary Day! This year Documentary Day will play a vital role in our history studies. Friday evenings will be reserved for documentaries and popcorn as we explore the last 150 years of U.S. history. We’ll continue to add in some science-themed documentaries, especially on rainy days. My kids and I have explored a plethora of topics via documentaries over the past few years thanks to YouTube, Amazon Prime, Netflix and our local library! Adding this simple time to our week has expanded our world and our knowledge and appreciation of it! I am a huge fan of gameschooling! With six kids ages 4-14, games are a great way for us all to learn together gathered around the kitchen table. They’re also a great way for kids to have some personalized instruction! 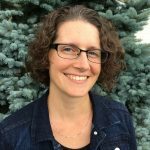 I recently shared why, as a reading teacher, I chose Nessy Learning to help my struggling reader. With gameschooling, my kiddo sees games. I see learning. We’re both happy! We also love apps like Words with Friends, Dragonbox, Stack the States, and Chess with Friends. Games like these make learning spelling, reading, algebra, geography and strategic thinking accessible and enjoyable. They also transform screen time from the passive to the active, threading learning into the day in invisible ways. What is geocaching? Geocaching is a real-world, outdoor treasure hunting game using a GPS. Using coordinates, game players navigate their way to find a geocache (usually a container of some kind) which holds some sort of trinket or treasure! What’s inside varies but the fun is in the finding! Geocaching.com tells you everything you need to know about geocaching and how to get started. You’re may be wondering what this has to do with technology. Using a GPS or a geocaching app requires some tech-savvy skills. (Don’t worry, it’s really simple!) It also requires you to get out and explore the world around you! You can’t avoid learning some navigation skills, like reading a compass and latitude and longitude, as you meander your way to the hidden geocache! Geocaching is a huge hit at our house. It’s a great blend of technology, outdoor exploration and teamwork! These are just 5 of the ways we’ve been using technology to add some excitement to our homeschool, making our learning a little more home and a little less school. It feels authentic and engaging, perfect for keeping homeschool burnout at bay and infusing your home with the joy that you envisioned when you decided to homeschool. 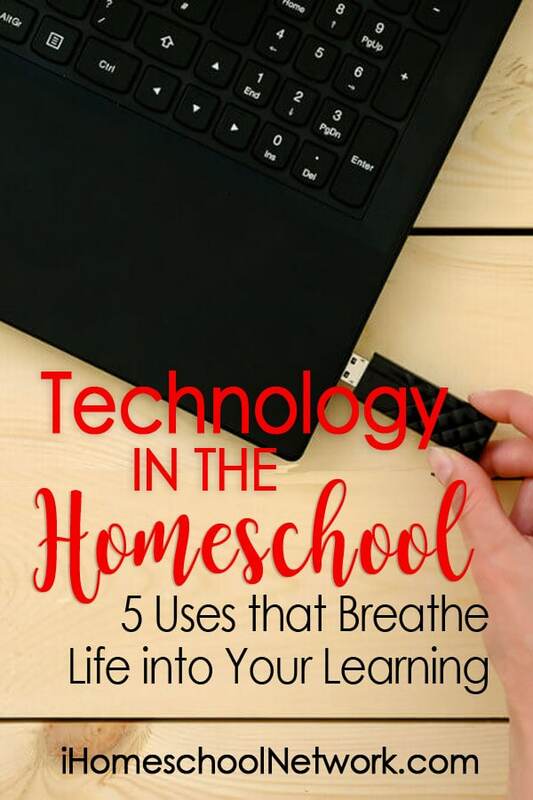 So I invite you to find ways that technology can breathe life into your homeschool. I promise that you won’t see “screen time” the same way again! Happy Homeschooling!